For many people, the dog is a member of the family. Pack a to-go bag for pets, too when they're going on the road with the family. Our schnauzer Heidi (now in doggy heaven) was like that to us. When soccer Saturday rolled around, she was bundled into the minivan along with the duffle bags of sports stuff. At the time, I didn't go for the doggy car seat, but today I've warmed to them. They're a good idea if your dog has a tendency to roam or jump around visiting the rest of the family members, seat by seat. Yes, I know cats travel, too. But dogs are the more frequent travelers. I've yet to see a family let Fluffy the cat bound out of the hatchback at a soccer practice or baseball game. If you do take a cat in the car, I would advise putting her in a carrier. Cats will slink under the brake pedal without your realizing it - until you can't press the brake pedal. If you want to confine your cat or dog on a somewhat regular basis, invest in a pet gate for the back of your car . I use earth-rated dog waste bags . They're designed to hold the smelly stuff safely and be earth friendly. But I think I really just like the lovely lavender scent. It totally beats the alternative. This may seem like a "duh", but often times dashing out the door you or the kids might forget it in a rush. By having a "spare" or second leash already in the car, there's less to think about in the rush to get out the door to soccer practice. 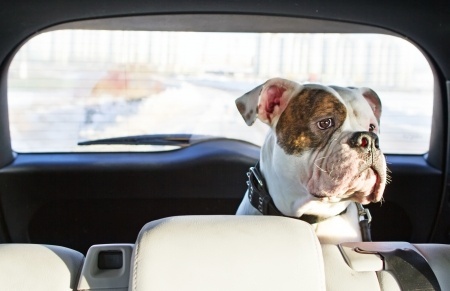 Sometimes, your errands or carpool might take longer than expected; be prepared so your hungry animal doesn't get restless or loud (barking comes to mind here). If you're unsure whether there will be a faucet or hose nearby your destination(s), consider including a water bottle in your pet car kit. They needn't be fancy - even a plastic picnic-style dish will do. In a pinch, it's nice to know you don't have to consider whether your destination(s) will have pet-friendly feeding or watering areas. Get the e-book on all things pets and family!